Although LEDs are very efficient light sources, get enough of them in one place and the current really adds up. 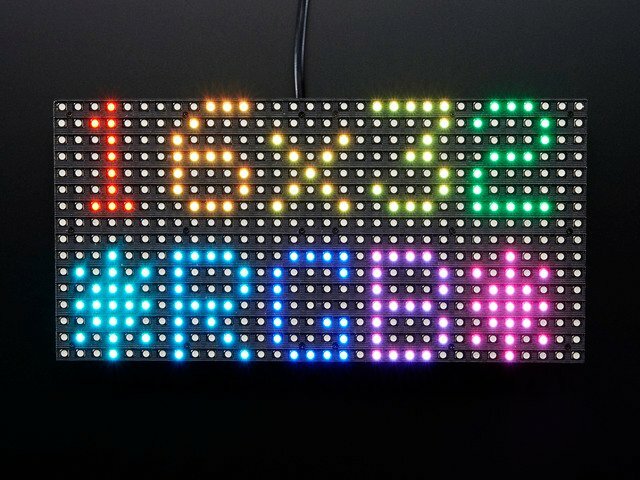 A single 32x16 or 32x32 RGB matrix, running full tilt (all pixels set white), can require nearly 4 Amps of current! Double that figure for a 64x32 matrix. On average though, displaying typical graphics and animation, these panels will use less…a 2A supply is usually sufficient for a single 32x16 or 32x32 panel, or 4A for a 64x32 panel. There’s no harm in using a larger power supply rated for more Amps (e.g. a 10A supply), but never use one with a higher Voltage (use 5V, period)! Our parts suppliers occasionally make revisions to designs. As a result, the connections have changed over time. We'll walk through the different wiring combinations here…pick the explanation that matches the panel(s) you received. On the left is a screw post power connector (with adjacent pads for soldering wires directly). On the right, a Molex-style header. Some panels will have two headers…the power cable included with these panels has connectors for both headers. With the posts-and-pads connector, you can either screw down the spades from the power cable, or another approach is to cut a 2.1mm jack from this extension cord and solder it to the pads on the panel back. This way you can plug the 5V from a wall adapter right in (the one we have in the shop is suggested). Simply cut the other half of the cable off, and strip the wiring so you can solder the red wire to +5 and the black wire to ground. Solder both pins correctly to the power port. Make sure you get this right because there is no protection diode! If your panel has the Molex-style header, just plug in the included power cable, observing the correct polarity. If your power cable came with spades at the opposite end of this power cable, they can be screwed into a 2.1mm terminal block adapter. Works nicely! Don't allow the exposed connectors to contact metal though…you should probably cover this with heat-shrink tube or electrical tape. These panels are normally designed for chaining (linking end-to-end into larger displays)…the output of one panel connects to the input of the next, down the line. With the limited RAM in an Arduino, chaining is seldom practical. Still, it’s necessary to distinguish the input and output connections on the panel…it won’t respond if we’re connected to the wrong socket. Although the panels support chaining, this is VERY impractical on Arduino-class boards and our library DOES NOT SUPPORT it. A more powerful system like a Raspberry Pi may be a better choice for chained panels! Flip the matrix over so you’re looking at the back, holding it with the two sockets situated at the left and right edges (not top and bottom). On some panels, if you’re lucky, the sockets are labeled INPUT and OUTPUT (sometimes IN and OUT or similar), so it’s obvious which is the input socket. If INPUT is not labeled, look for one or more arrows pointing in the horizontal direction (ignore any vertical arrows, whether up or down). The horizontal arrows show the direction data moves from INPUT to OUTPUT — then you know which connector is which. If no such labels are present, a last option is to examine the plastic shroud around the connector pins. The key (notch) on the INPUT connector will face the outer edge of the panel (not the center). A 32x16 panel uses this pin arrangement. The labels might be slightly different, or the pins might not be labeled at all…but in either case, use this image for reference. Notice there are four ground connections. To ensure reliable performance, all four should be connected to GND on the Arduino! A solderless breadboard is handy for making this split. Here’s the layout for 32x32 and 64x32 panels. We’ll call this “Variant A.” Some panels use different labels, but the functions are identical. The layout is very similar to the 32x16 panel, with pin “D” replacing one ground connection. This is the layout we’ll be referencing most often. If you have a 32x32 panel with no pin labels at all, then use this layout. “Variant B” for 32x32 and 64x32 panels. The wiring is identical to Variant A above, only the labels are different. Ground pins aren’t labeled, but still need to be connected. LAT (latch) is labeled STB (strobe) here. R1/G1/B1/R2/G2/B2 are changed to R0/G0/B0/R1/G1/B1…but again, no functional difference, it’s just ink. Our earliest 32x32 panels had a two-socket design, let’s call it “Variant C.” All the same pin functions are present but the layout is very different. R/G/B on the upper socket correspond to R1/G1/B1 in Variant A. R/G/B on the lower socket correspond to R2/G2/B2. All the other signals (A/B/C/D/CLK/LAT/OE) need to be connected to both sockets — e.g. one pin on the Arduino drives both CLK pins, and so forth. Jumper wires inserted between Arduino headers and a ribbon cable — this works well for testing and prototyping, but is not durable. 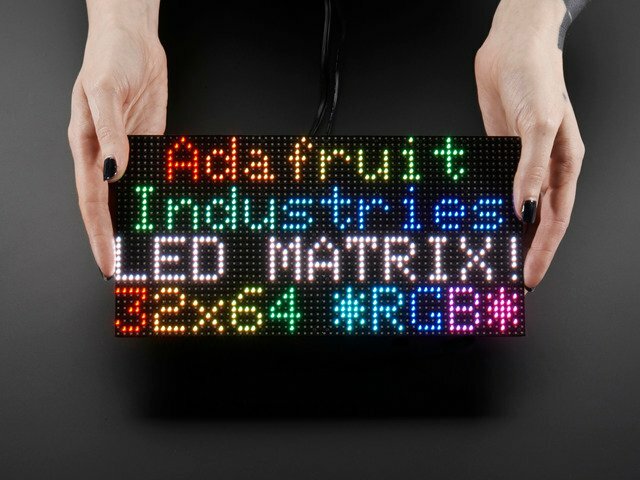 The Adafruit RGB Matrix Shield makes connecting these panels to an Arduino as easy as can be, and is best for permanent installations. One could build a proto shield to replicate the pinout of option #2. But given the Matrix Shield’s low cost, this might not be worth the effort nowadays. These panels are normally run by very fast processors or FPGAs, not a 16 MHz Arduino. To achieve reasonable performance in this limited environment, our software is optimized by tying specific signals to specific Arduino pins. A few control lines can be reconfigured, but others are very specific…you can’t wire the whole thing willy-nilly. The next pages demonstrate compatible wiring…one using the RGB Matrix Shield, the using jumper wires. This is the preferred method for pairing these matrices with an Arduino-sized board, as it’s quick and trouble-free. 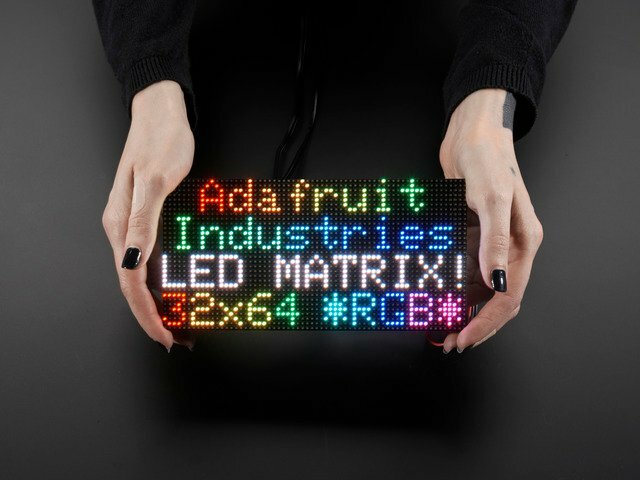 The Adafruit RGB Matrix Shield works with the Arduino Uno and compatible ATmega328-based boards like the Adafruit Metro. It also works directly with the Adafruit Metro M0…and with one or more jumper wires can work with the Metro M4 (and potentially other boards with this form factor, if a compatible Arduino library is available). The shield does not work with the Arduino Mega — see the “Jumper Wires” page for pinouts, or consider making your own Mega proto shield for that board. The shield arrives unpopulated and you’ll need to do a little soldering to get it going. Header pins are installed from the underside and soldered on top. Three components — a button, power terminal and 16-pin header — insert from the top and are soldered underneath. The 16-pin (8x2) header must be installed in the correct orientation! The polarity notch is indicated on the silkscreen, or you can see in the photos above that the notch faces the digital I/O pins. If you install this backwards the matrix will not work! 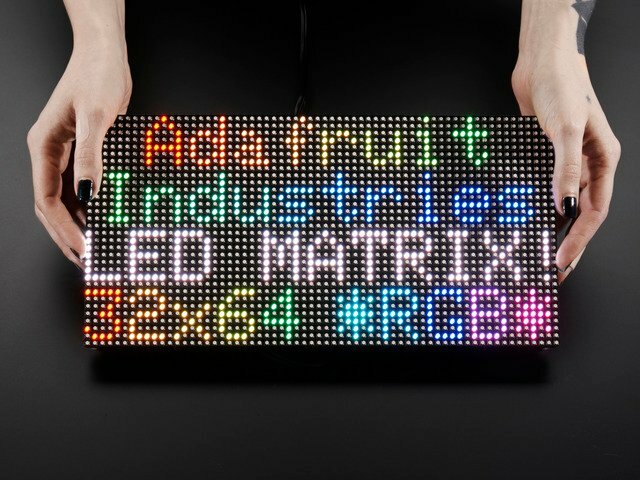 Power to the LED matrix can be connected to the shield’s screw terminals — red wire to +5Vout, black wire to GND — and the whole circuit is then powered from the Arduino’s DC jack or a USB cable at a safe and regulated 5 Volts. Use a small file or hobby knife to cut the PCB trace between the two pads indicated here. Solder a wire from the adjacent “CLK” pin to the “Analog In 4” pin. We have example code ready to go for these displays. It's compatible with the Arduino Uno or Mega…but not other boards like the Leonardo, nor “Arduino-like” boards such as Netduino…programming gurus might be able to port it to other microcontrollers by adapting the C++ source, but as written it does some pretty low-level, non-portable things. Both libraries can be found and installed using the Arduino Library Manager (Sketch→Include Library→Manage Libraries…). 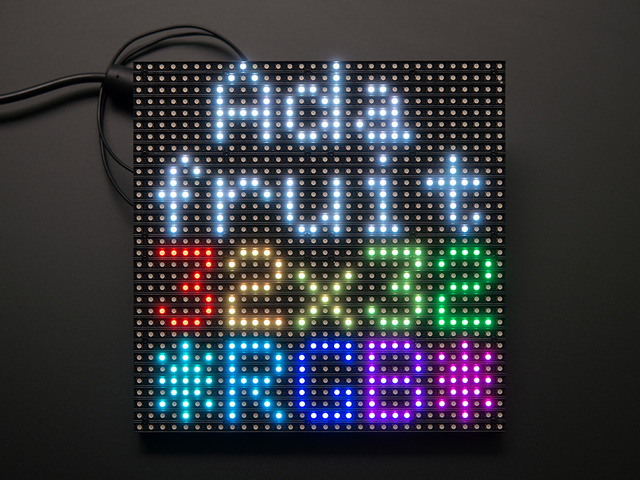 Search for “gfx” and “rgb matrix panel” and install the corresponding Adafruit libraries. Now you are ready to test! Open up the IDE and load File→Examples→RGBmatrixPanel→testcolors_16x32 (for the 16x32 panel) or File→Examples→RGBmatrixPanel→colorwheel_32x32 (for the 32x32 panel). This is a test pattern that shows 512 colors (out of 4096) on the 512 pixels. Since there's no really elegant way to show a 3-dimensional color space (R/G/B) in two dimensions, there's just repeating grids of red/green with increasing blue. Anyways, this shows you the range of colors you can achieve! which is where we actually draw to the display. This code only draws one pixel at a time. 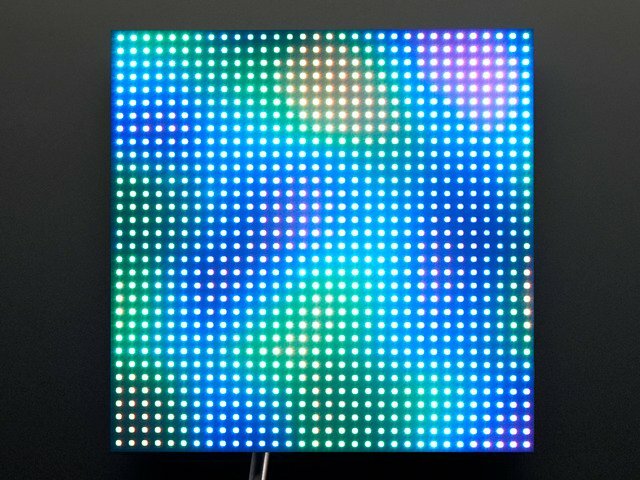 The x and y coordinates are the individual pixels of the display. (0,0) is in the top left corner, (31, 15) is in the bottom right (remember that we start counting at 0 here!). To create a color, you will want to use the helper funciton Color333 which will take three 3-bit numbers and combine them into a single packed integer. So for example, the first argument, r can range from 0 to 7. Likewise for gand b. To make a pixel that is pure red, r would be 7 and g, b would be 0. To make a white pixel, set all to 7. To make a black (off) pixel, set the colors to 0. A similar function, Color444, accepts three 4-bit numbers for up to 4096 colors. Now we can open up the next example, which shows the rest of the library capabilities. There's zero documention out there on how these matrices work, and no public datasheets or spec sheets so we are going to try to document how they work. 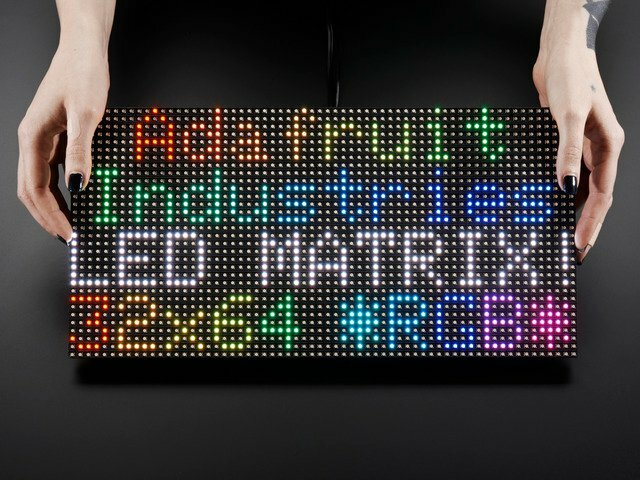 First thing to notice is that there are 512 RGB LEDs in a 16x32 matrix. Like pretty much every matrix out there, you can't drive all 512 at once. One reason is that would require a lot of current, another reason is that it would be really expensive to have so many pins. Instead, the matrix is divided into 8 interleaved sections/strips. 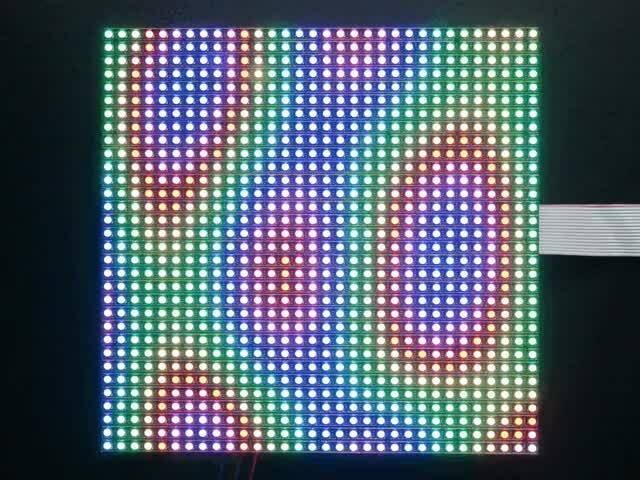 The first section is the 1st 'line' and the 9th 'line' (32 x 2 RGB LEDs = 64 RGB LEDs), the second is the 2nd and 10th line, etc until the last section which is the 7th and 16th line. You might be asking, why are the lines paired this way? wouldnt it be nicer to have the first section be the 1st and 2nd line, then 3rd and 4th, until the 15th and 16th? The reason they do it this way is so that the lines are interleaved and look better when refreshed, otherwise we'd see the stripes more clearly. The only downside of this technique is that despite being very simple and fast, it has no PWM control built in! The controller can only set the LEDs on or off. So what do you do when you want full color? You actually need to draw the entire matrix over and over again at very high speeds to PWM the matrix manually. For that reason, you need to have a very fast controller (50 MHz is a minimum) if you want to do a lot of colors and motion video and have it look good. I'm seeing weird pixel artifacts, ghosting, or other glitches. Wiring problems are probably the biggest source of display issues. Especially if you are attempting the "jumper wire" connection method. There have also been cases of power supplies causing interference. This guide covers both proper wiring and power. If all of that seems OK and you are still seeing weird pixels, it may be due to how the pixels are being driven in software. You can try some tweaks as covered in the guide, but the issue may not entirely go away. If you've tried to troubleshoot and still have issues, post in the forums and we can take a look. Every now and then a display can just be bad. Wiring issues tend to look like this and are often fixable if you can find the wrong / bad wire. You see what you expect for the most part, but also some other artifacts. This can happen even with proper wiring. This guide was first published on Dec 11, 2012. It was last updated on 2019-04-23 13:22:19 -0400.